MASVINGO – A group of Zanu PF youths today, September 15, held a press conference at Chevron Hotel where they denounced Zimbabwe National Liberation War Veterans Association (ZNLWVA) chairperson Chris Mutsvangwa, warning that they would soon deal with him decisively should he continue undermining the first family. 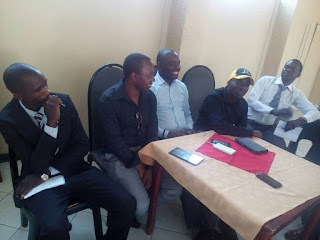 Some of the youths present at the press conference were Talent Chivange of the Zimbabwe Youth Council (ZYC), Zanu PF youth league member Persie Mukwata, National Youth Service Graduates Association (NYSGA) deputy provincial commander Willie Mwarakuza, Chamber of SMEs secretary general Biggie Kwangwa and student leader Mike Taderera. The group, believed to be strongly linked to the G40 faction in Zanu PF's vicious succession wars, said Mutsvangwa, ZNLWA secretary general Victor Matemadanda, spokesperson Douglas Mahiya and political commissar Francis Nhando were masquerading to make it appear like they had broad support from war veterans when, in actual fact, they had no support at all. "We as the revolutionary youth of Zimbabwe, condemn in the strongest possible terms utterances by one Mr Mutsvangwa to the effect that he and his so-called A Team will be out to de-campaign our iconic president and revolutionary President Mugabe and Zanu PF in the forthcoming watershed election. Before we go any further, we would like to categorically state that Mutsvangwa's imperialist tendencies will be resisted heavily by the young people," Chivange said. Mutsvangwa was earlier this week quoted as saying the war veterans, whom he termed the 'A Team', would campaign for anyone else other than Zanu PF if Mugabe did not immediately call an extra-ordinary congress to elect his successor. This, Mutsvangwa said, would deal a blow to the G40 faction which he claimed had hijacked the party and wanted to smuggle in Defence Minister Sidney Sekeramayi through the back door to succeed Mugabe at the expense of Vice President Emmerson Mnangagwa. "We know that Mutsvangwa is part of an organised syndicate which is bent on destabilising the peace that our mothers and fathers fought for and our peace as a country. As young progressive youths, we will not sit back and watch. I think we are 67 percent of the total population and it is such a disgrace for Mutsvangwa and company to think that young people of this country are that feeble to leave him and his four colleagues to continue saying their rubbish," said Chivange. Responding to questions from the floor on how exactly they were going to 'deal' with Mutsvangwa, the youths said they will not engage violence but may ask that he and his group be arrested.